Animations are controlled using scripts. 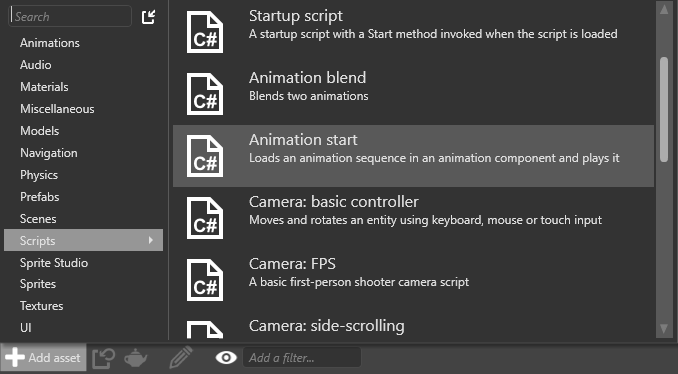 You can add an AnimationComponent to an entity and set up its parameters in Game Studio. The AnimationComponent class is designed to be used mainly from a script. 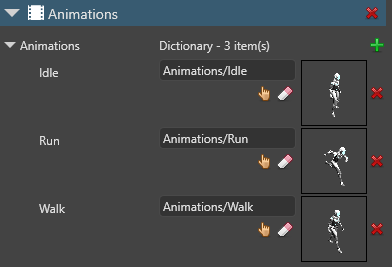 Animation clips you reference in scripts must be added to the same entity under the AnimationComponent. For more information, see Set up animations. Xenko includes a pre-built AnimationStart script. You can use this script as a template to write your own animation scripts. In the Asset View (bottom pane by default), click Add asset. Choose Add asset > Scripts > Animation start. Specify a name for the script and click Create script. 3a. 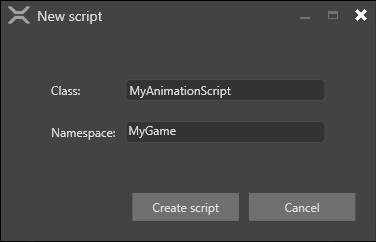 If Game Studio asks if you want to save your script, click Save script. 3b. If Game Studio asks if you want to reload the assemblies, click Reload assemblies. Edit the script as necessary and save it. This sample script assigns a simple animation to a character based on its walking speed. You an also override the animation blend tree and do all animation blending in the script. The templates First-person shooter, Third-person platformer and Top-down RPG, which use some advanced techniques, are examples of how to do this. For more information, see custom blend trees.